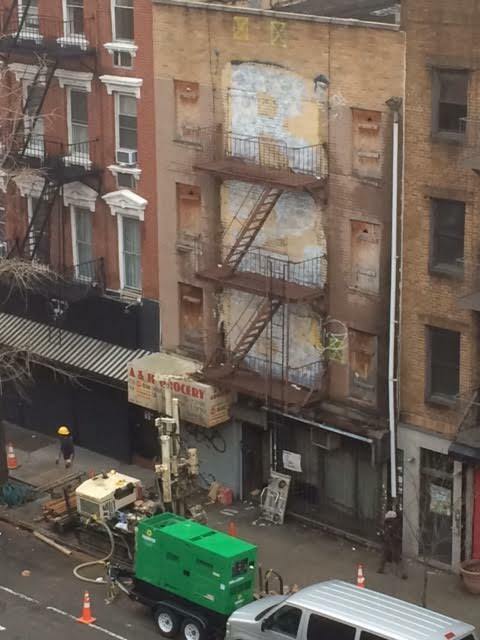 Residents yesterday spotted a Davey Drill taking (presumably) core samples from outside 204 Avenue A, the bricked-up building here between 12th Street and 13th Street. No. 204 has been vacant since at least 2009. By 2009 the place had been boarded up. Here's the story about this building and another section 8 building 535 E 12th street which also had drilling for soil samples this week. Both 204 Ave A and 535 E 12th will be demolished presumably later this year for new housing. The residents of 535 which were displaced due to severe structural problems will move into the new (I believe 7 story building on A, they will be able to purchase these apartments for a very very low cost. A new somewhat market rate building will be built at 535 12th, it will be 6 stories tall. 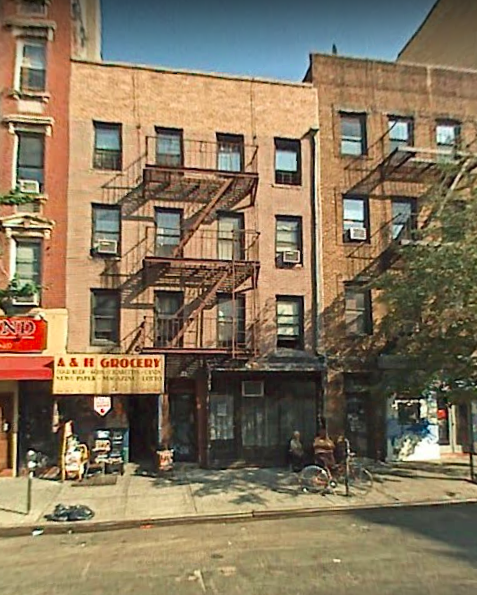 The same company which remodels the former squat on 13th Street btw A and B will be devoting these 2 buildings. Not so sure they are going to use that on the city owned building. Workmen have been setting up equipment where that drill is for the last couple weeks and going in and out of the building next door that housed that Bright Audio place. They have been ripping that place apart and working on the basement level, too. Thanks for the history 9:12. I've been wondering what the deal was with this building. So weird to brick up the windows like that. Can they build a 7 story building in this neighborhood? I thought buildings had to be 6 stories or lower in the EV? They can build anything, any damn please they want. Trust me. Owners of that deli are in business next to 7B. I may be wrong about a 7 story building but there is a market rate rental with 7 floors built about 8 years ago on 12th street, filled exclusively with millennials and their dogs. Anyway to answer the question about the bricked up windows, 535 had squatters and other folks moving in during the past several years, that building had cinder blocks which still didn't stop the intruders. Nearby neighbors feared someone would start a fire and burn down the block. I think these 2 buildings 535 E 12th st & 204 Avenue A needs some community land-trust that must replaced with real affordable Housing to housed low-income families in need in the neighborhood let's be real on that.